Colorado Fishing Trips are available all year. Guided trips are in the South Platte Drainage System, in both river and still waters. Most destinations are 1 to 1.5 hour travel time, one way from Colorado Springs. If possible, please get your fishing license prior to the day of the trip. Depending on season and weather, bring extra layers of clothing, olarized sunglasses, a brimmed hat and sunscreen. Montana Guided Trips are available seasonally April - Mid May and Aug. - Sept. Other dates are negotiable. Lodging needs to be booked at least 6 months in advance. Camping is available, but limited. Montana trips are customized adventures, so include your phone number when planning your trip. Be Prepared! If you need waders, tell us your shoe size. Do not wear studded boots, as they are hard on the boat, and the River's not too slippery. Drinks (besides water), and Gratuity are not included. 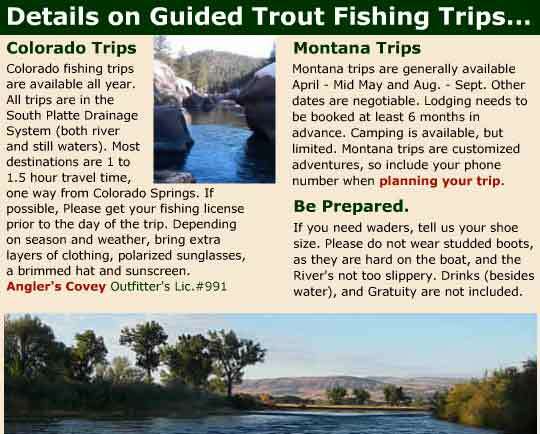 > Plan Your Fly Fishing Trip Now!